One of the cool things about the watches from the 1950's is the designs often had a lot of flair. 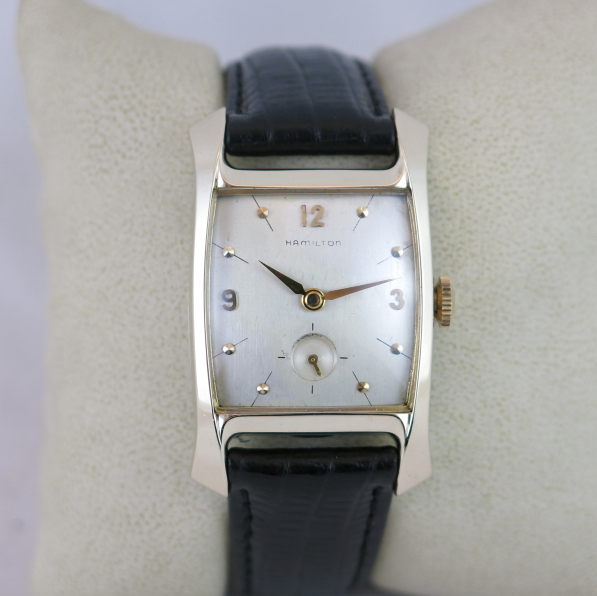 Of course, there were plenty of plain-Jane round watches in the line up but Hamilton introduced a ton of watches with uniquely shaped cases and even the round watches usually had great looking dials. The Baxter is a good sized watch. That's another cool thing about the watches from the 1950's - or at least the later 1950's - watches started to get a little bigger. The Baxter came in a 10K yellow gold filled case with a stainless steel back. 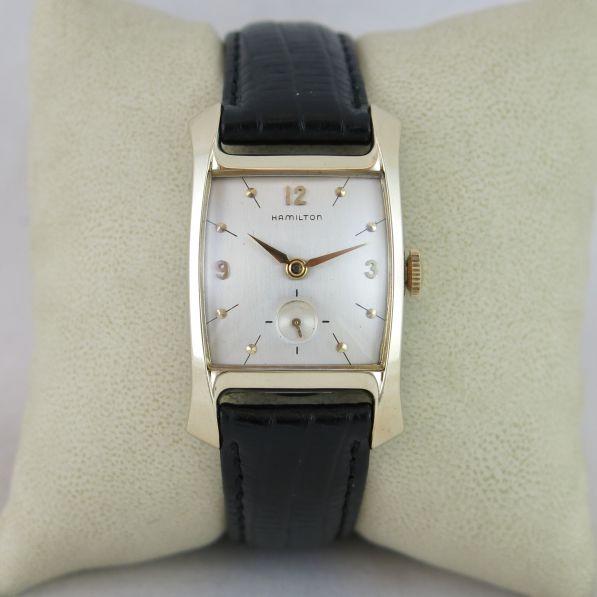 The butler-finished sterling silver dial has solid 18K gold numerals and dots. I've tried a number of times to land a Baxter project watch but they usually get a lot of interest and sell for more than I'm willing to pay. But I did finally get one, and it was in nice condition too. The crystal is going to need to be replaced but a thorough cleaning will make a big difference. As I said above, the back is stainless steel. 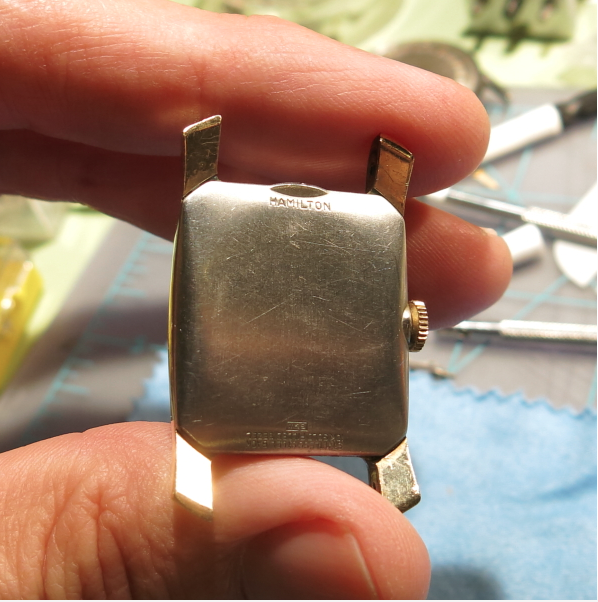 This one is engraved and overall this watch case has very little signs of wear. Inside the Baxter you will find a US-made 8/0 sized movement... either a 747 or a 730 - which replaced the 747. Notice on this movement there is no serial number. 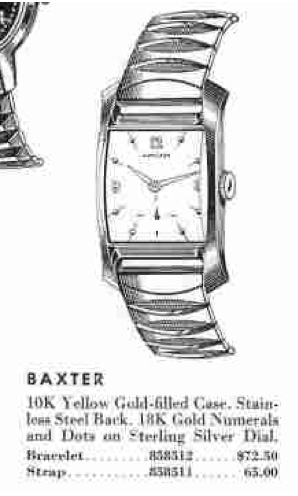 Hamilton stopped putting serial numbers on movements in 1955 so this probably an early Baxter. 747 movements are great movements to overhaul. Really, all the US-made movements from this time period were really well designed and well made. 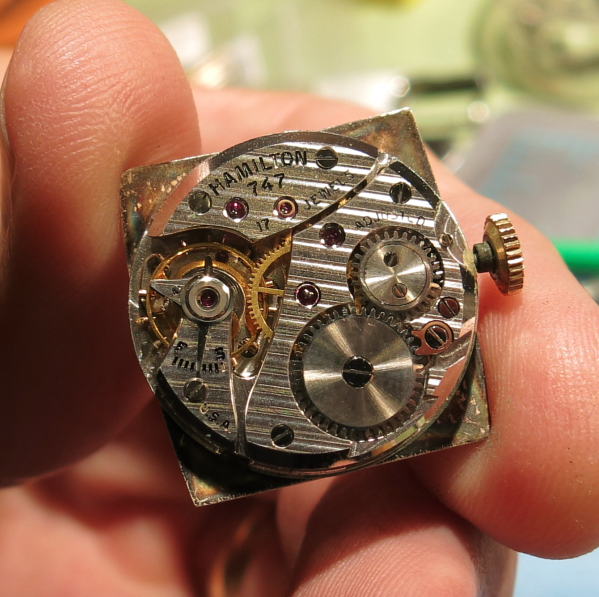 After a through cleaning you can see this movement is purring away keeping excellent time. 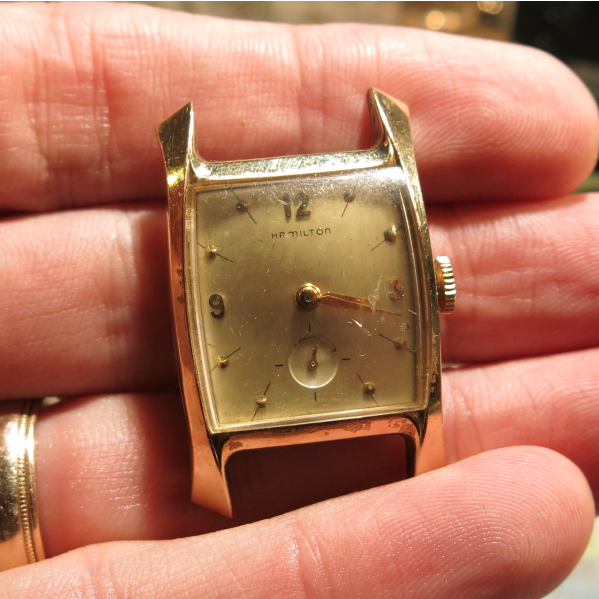 Well, in it's finished state, the watch cleaned up very nicely. Here it is with a nice new glass crystal and a fresh 18mm teju lizard strap. 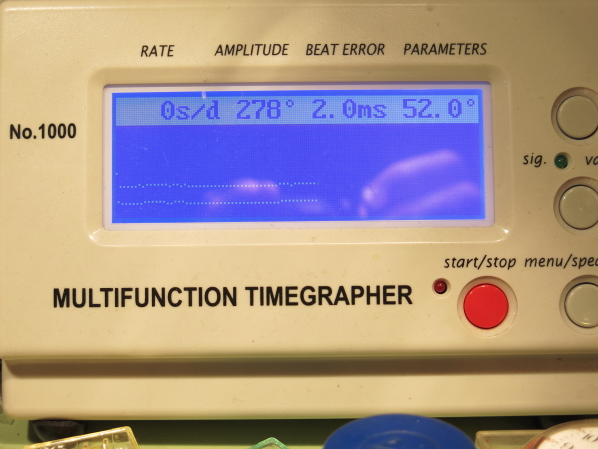 Unfortunately the dial finish was a little compromised by moisture getting inside the case. When I tried to clean the dial up the finish lifted right off and the printing faded on me. You can't tell in this photo, but the dial is very splotchy depending on how the light hits it. I think I will get it refinished so it will look as nice as the case. UPDATE: Well, I got the dial refinished and it definitely looks much better now. What do you think? It's probably a little hard to tell in the photos but the Hamilton logo is darker and the finish on the dial is a consistent gloss. how did you refinish the dial? was it costly? There are a handful of dial refinishers out there that I'm aware of. I personally prefer to use International Dial (www.internationaldialco.com). I think they do the best job matching what was originally done. Usually they nail it but sometimes it's a little off when the dial is especially complicated. They nailed this Baxter dial though. Cost is in the $50 range, give or take, plus postage.